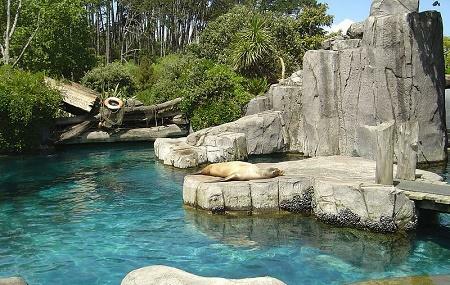 Spread across 17 hectares (42 acres), Auckland Zoo is home to the largest collection of native and exotic animals in New Zealand. 138 different species and over 875 animals call the zoo their home. To get up close and personal with some of the world’s most amazing creatures, do sign up for their ‘behind the scene’ experiences. There is lot to see and do all year, including events, animal encounters, behind-the-scenes experiences and more! Auckland zoo is a smoke free zone. Smoking is prohibited. Entry is free for children under four years. Last admission at 4.15 pm. Western Springs College Bus Bay. Great North Road near Motions Road bus stop. There are 4 cafes within the zoo premises. How popular is Auckland Zoo? People normally club together Voyager New Zealand Maritime Museum and Devonport while planning their visit to Auckland Zoo. The environments for the animals are wonderful. I went to a zoo open late, which was a great opportunity. Unfortunately, the people giving the talks seemed to be not sure of the schedule that they were supposed to be working on so there were some missed sessions. Be aware there are a lot of areas under construction or renovation, so you won't be able to see some of the animals at the moment. Nice compact zoo. The way it is designed it is easy to get from any part to another. Good range of animals too. Annual pass is great to take kids there regularly. We loved the place! Firstly the animals have space they are not enclosed and they get treated well. Also the separation to continents is great and very cool for kids. Generally kids get to walk around and take it all in. It's a must for every family even on a short visit. Great 3/4 of a day adventure. Zoo staff are all amazing- please give yourself all a pat on the back. Toilets clean and modern. And plenty of them too! From infant to grandparents and all ages in between. Be prepared for an amazing outing!